Shannon and Patrick were recently joined together in marriage during an intimate ceremony at the chapel located on the grounds of a gorgeous Cedar Creek Lake Estate. These college sweethearts are such a FUN couple and we were thrilled to have been a part of their big day! The occasion was a spectacular display of rustic elegance with a Polynesian flair. Tropical flowers in hues of pink, greens, and soft champagnes accented the affair and the towering white cake was sensational. Guests were treated to incredible views and lively dancing. The couple left in a vintage car to the sights of a brilliant fireworks display! A Hibiscus flower adorned the Save the Date, Wedding Invitation, Programs, Note cards, and Direction Cards all created by HH Design House. 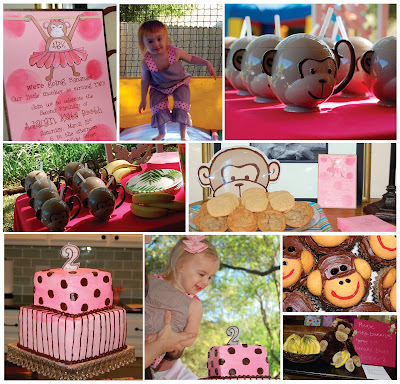 Each item was designed to capture the spirit of their celebration. A favorite piece of ours was their direction cards which were customized entry passes/hangers for car rear view mirrors. These were mailed a week and a half ahead and helped to both generate excitement for the event, and facilitate directions and gate entry. We were so captivated by Shannon's pictures we immediately had to find out who did them, and were please to make acquaintance with them and beg for the images! Thanks to Neal and Jennifer at Vim Studios in Dallas, Texas for being kind enough to share. Be sure and check their site for more fabulous photos! To the happy new couple we say "Aloha" from HH Design House...a word that has as many meanings as colors in their perfect sunset, and we send it as our best wishes! May you have a lifetime of happiness. Catching up on thank you notes, packing the kiddos off for summer camp, resurrecting an old pen pal or just seeking to spice up your everyday correspondence? Look no further, we at HH Design House have just the solution! 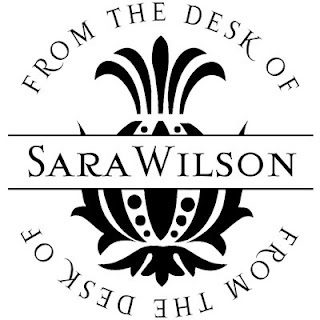 We LOVE personalization...and let's face it, who doesn't get a thrill from seeing their name in print??? This week for "Happy Hump Day" to give you a mid week boost, we are offering a discount on our Stampers by PSA Essentials. Regularly $44, this week only you can order them for $35/each! WOW!! 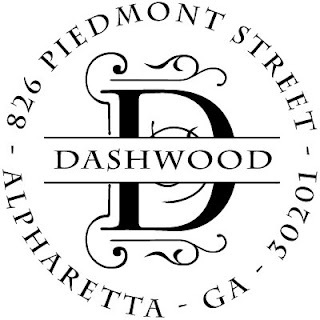 We offer many styles and variations of the address stamp, name/initial only, and other personalized options such as "From the Desk of" etc. Scroll down to check out a few options and view all style selections on our website, http://www.hayleyhardcastle.com/ . To place an order email us at info@hhdesignhouse.com. Remember this awesome opportunity is for this week only! Thank you for all the comments and entries we received!!! It was so fun to watch them come in and we are so glad to be getting some readership! We will try and not disappoint! Congratulation, Red Leopard! Email us back the style you'd like and the names and we'll get them ordered asap so you'll have them by next week! A little birdie told us that the "Red Leopard" is actually the Fabulous and Fun Abbey Hanson of Abbey Hanson Photography! We are so glad you're reading our blog and we love you bunches!!! Thanks everyone! We loved kicking off our happy hump-day posts, and remember to catch up with us every Wednesday! If you're like us, searching for the "perfect" gift for Dad can sometimes elude you...golf paraphernalia, tools, fishing tackle, and of course a tie...you've done it all before. If you find yourself in this dilemma, we at HH Design House just might have a solution for you! 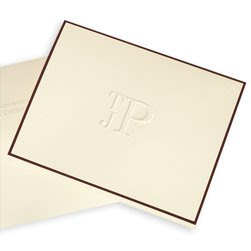 We love our note cards and think they are a desirable gift for anyone. 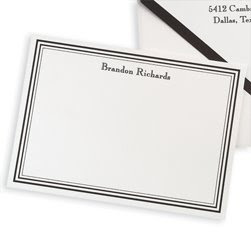 What's more personal than personalized stationery? Plus, it's a gift you can use year round...can't beat that! Shown here are just a few, but if you check out our website, http://www.hayleyhardcastle.com/ we have a whole gallery! In honor of our first "Happy Hump Day" we are also introducing our first "give-away". 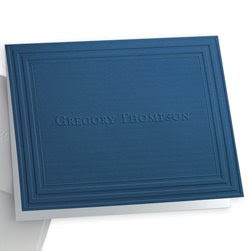 To have a chance to win a set of (50) Embossed Graphics note cards personalized for your father simply leave a comment on our blog letting us know which design you like the best. To be entered twice, give us a shout out on your blog and link back to us! The contest ends tomorrow (Thursday) at 3 p.m. central standard time and we will draw and announce the winner from the comments posted! Be sure and let us know if you are entering twice as well! On June 21st, be sure to squeeze your dad's neck and tell him how much you love him...he won't mind a bit that you'll probably be a little sweaty...after all it is the first day of summer! Prior to the previously mentioned impediment, there were already enough times daily I wanted to throw you against the wall. Just ask your partner in annoyance, Mr. Printer, how hard my slap is.... I mean business, and I am SO over bargaining with you. You see, I am an artist, not a "techie". I thought I "knew better" when I gaffed at the Graphic Design major and went straight for Painting and Drawing. I will create beautiful pictures with my own two hands, I thought! But alas, it was 2004, and without the computer, there was no way to get my designs to anyone, so I tried my hardest and learned it as best I could. Now, when people see mywork, everyone becomes a technology critic. I cannot count how many times I have been told not to use that program or that computer or that ftp or that file format, and frankly, I have NO IDEA what anyone really expects. No one has ever came into my studio and looked me in the eye and given me constructive advice. And even with simple things like email -- I finally switch over to the "professional looking" email addresses, and then you are barred from having your "professional" signature. Such things drive me dizzy! So, computer, with all these issues we were already having, why would you decide right now to quit working? Now when everyone is waiting to hear from me and I am trying to save for other investments. I already had you, I thought the computer column had a big "check" next to it! I'm not one to gripe, but I thought we'd had a good run with eachother. I was pretty good to you; always buying you the latest safety software, and I even carried you out of harm's way when Ike was barelling down last year. Perhaps like the rest of us, you're just plain weary. But must you really take 30 minutes to open a file, and then have a system error when I try to finally work on the file???? Do you know many things we used to get done in 30 minutes??? Remember the good ole days??? So instead of being able to comply with everyone's desires for their proofs, I am researching re-purchasing and re-loading all of my software on my hubby's laptop and wondering how much more of my life you stubborn machine will eat. In closing, since you seem to have a mind of your own lately, if you could send an auto-generated email out to my whole address book letting them know about the situation, that would be awesome. It just might score you a resting place in my garage instead of in a field a la "Office Space." Well, you have found us! You may have had a "sneak peak" if you frequent our website, but we over here at our 'house' have been working away trying to put some eye-candy up on the blog before we sent everyone and their mothers (well, at least our mothers) scrambling to check it out! Maybe something you see on our blog will awaken your own paper creativity, maybe one of our fabulous customer's parties will inspire you, maybe you will see something featured you didn't even know we did (and you'll HAVE to have it!) or maybe you just want to see what we've been up to lately! Whatever your reason, sign up to follow us, leave us a comment when you're here, and check back often! 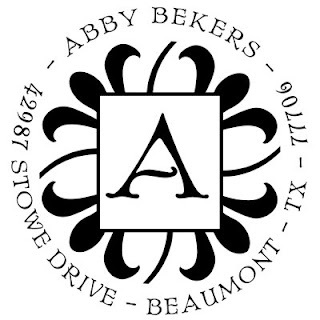 We are thrilled to be able to share our passions with you -- whether they are our custom invitations, a "must-have" Stella & Dot piece, a fabulous flip-flop find, or even a toe-curling new OPI shade. The 'house' team of LG + HH get easily excited and can't wait to blab it, ahem, blog it! From our 'house' to yours ... May you always have reasons to celebrate! Wendy and Luke were recently joined together in marriage and HH Design House was delighted to play a roll in the gorgeous occasion. 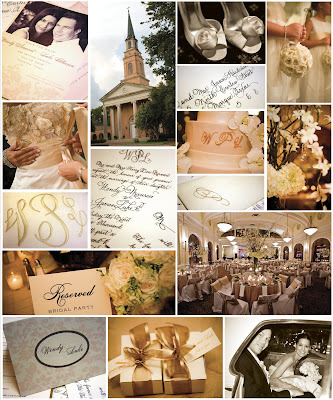 The summer nuptials took place in Houston with the ceremony at Second Baptist Church and the reception in the Crystal Ballroom of the Rice Hotel. The bride is a talented Stylist and it certainly showed in this dazzling wedding and reception. 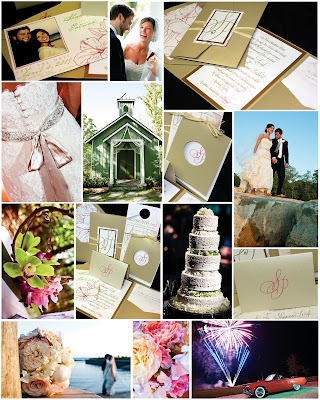 A tasteful color palette was chosen in the soft shades of ivory, champagne, blush, and candlelight. Luscious flower arrangements enhanced tables in varying heights and textures...the contrasting towering centerpieces of curly willow branches with cherry blossoms wired in and the low round full centerpieces had a stunning effect! The elegant ballroom was brimming with frothy textures and crystal accents. Wendy went with a "Traditional with a Twist" scheme for all products produced by HH Design House, using classic calligraphy, but with the addition of some color and graphic elements. 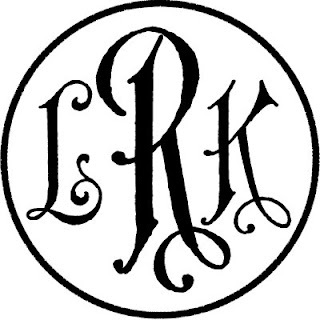 Their monogram was a reoccurring concept appearing throughout the tasteful occasion . Photos are by the fabulous Leslie Gaworecki of Goodlight Photography, who we just adore! Leslie shot for Hayley's own Wedding and she and her Studio Manager, Ellen, are always so gracious to send not only her incredible photos our way, but also their clients! Romance and refinement were abundantly apparent in this ethereal affair. We wish the couple a lifetime of happiness! Invitation, Save the Dates, Calligraphy, Album, Napkins, Favor Tags, Thank Yous, Programs, Reserved Signs. Everyone loves a New Year's Eve party and HH Design House was delighted to supply party wares for a shindig that would rival any rockin' New Year's bash! 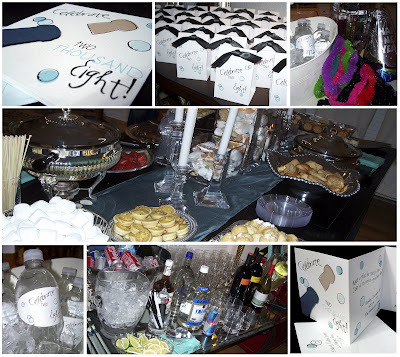 Aside from the alluring invitations, customized water bottles, favors, and napkins complimented the evenings festivities. With merriment and cheer, one year was concluded and another commenced. New Year's Eve is one of my favorite days, as is New Years Day...I love the anticipation of being at the cusp of another new year and the hope which seems to fill us all at the onset of that year. Whether living it up at a blow-out like this or snuggled up on the sofa with a loved one watching the ball drop...the joy of a new year is not hindered. Even the most pessimistic of folks appear to catch a glimmer of the contagious exhilaration of a new year dawning. So it is safe to say as the last cork popped, the last strains of "Auld Lang Syne" dwindled off, and the stars twinkled promisingly in the late night/early morning sky, a good time was had by all the revelers attending this celebration! Hilary and Matt exchanged vows in coastal California and we were so happy to contribute to the occasion! The heartfelt ceremony took place on the Pepperdine University campus in Malibu, CA where the couple first met. An intimate reception followed with a seated dinner at the Ritz Carlton, Marina del Rey. The color scheme was adapted from the gorgeous stained glass windows of the chapel and incorporated the bright shades of spring. Beautiful blues, reds, yellows, greens and orange were seen in vibrant arrangements adorning the celebration. The same popping hues were also used in the programs with a variety of ribbon colors. Our calligraphy enhanced not only the wedding invitation, but added style everywhere from the programs right down to the place cards. 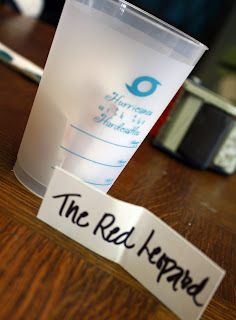 The logo created by HH could also be seen everywhere, including the customized water bottles. As a perfect complement to their SoCal nuptials, the new "Mr. & Mrs." traveled all along the California Coastline for their honeymoon. 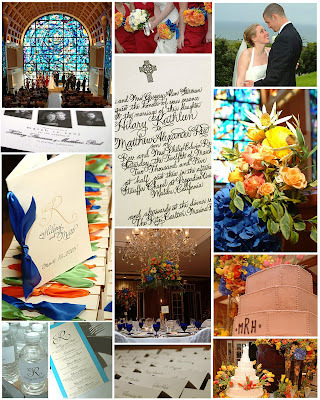 We were thrilled to be a part of such a vibrant and elegant wedding! 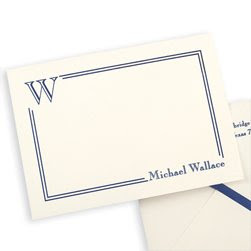 Invitation, Calligraphy, Napkins, placecards, programs, menus, water bottles.